No previous snowshoeing experience is necessary, officials said. CRATER LAKE, Ore. — Winter adventurers will soon be able to take a guided tour through one of Oregon’s most iconic landmarks. 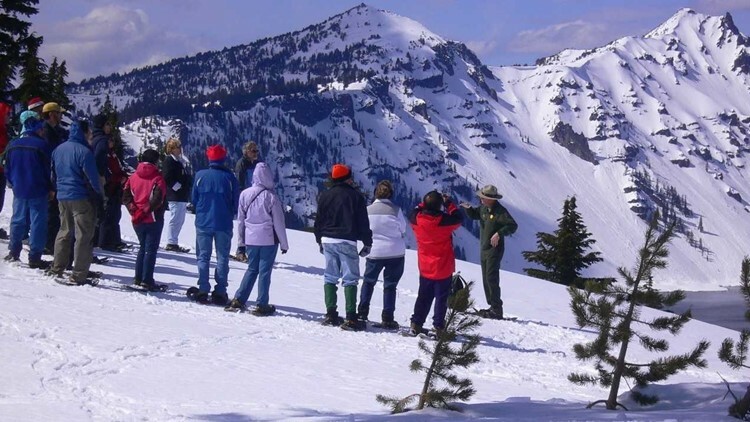 Ranger-led snowshoe walks at Crater Lake National Park kickoff for the winter this weekend. The walks take place on Saturdays, Sundays and holidays from Dec. 8 through April 28. Walks will also be offered daily from Dec. 15 to Jan. 6, except for Christmas Day. Snowshoes will be provided free of charge. Participants have to pay Crater Lake National Park’s $15 entrance fee but don’t have to pay extra money for the walk, according to park officials. Walkers must be at least 8 years old and come prepared with warm clothing and water-resistant footwear. No previous snowshoeing experience is necessary, officials said. Walks start at 1 p.m. and typically last two hours. The route is up to the ranger, but most walks begin at Rim Village and explore the forests and meadows along the rim of the lake. The walk covers one to two miles of “moderate-strenuous terrain,” officials said. Space on the tour is limited and reservations are required. If you want to participate in a walk this winter, call the park’s visitor center at 541-594-3100.